Call, answer, transfer, view the status of all connected extensions, intercept a call for another extension, display name and number of incoming calls, make a call directly from the integrated list of contacts or from the log and much more... Everything in just one click. To understand all their rich functions, please check on their website (https://www.asterswitchboard.com) for more details. 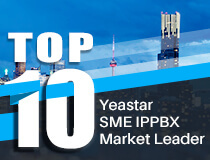 Note: Yeastar S-Series VoIP PBX is compatible with AsterSwitchboard pro version ONLY! In this guide below, we tested AsterSwitchboard pro Trial version, and introduce how to configure Yeastar S-Series VoIP PBX with AsterSwitchboard. 3.2 To access the application setting a password is required. The default one is 1234. You may also update the password by clicking 'ChangePassword'. 4.2 If the settings are correct you should be able to view all the internal extensions and you are ready to use AsterSwitchboard.